This review of Keywords for Radicals is an excerpt from a longer review recently published in the International Journal of Communication. The full review (by Jack Bratich of Rutgers University) also included another title—you can read the review in its entirety here. And you can find out more about Keywords for Radicals here. This splendidly sprawling tome arrives with a title announcing its interventionist direction and anticipated readership. The book thus broadcasts its commitment to the radical potential of the words within it. What is a keyword? Fritsch, O’Connor, and Thompson do a fine job distinguishing keywords from definitions: Rather than settling meaning, meaning itself is the subject of historical investigation. In tracing out these historical settlements, a keyword analysis can undermine common sense, especially when (due to historical circumstances) the words are more “brittle” (Williams’ 1983 term, as the editors note). The keywords here do not fix meaning, but mark moments when consensus is in crisis, thus rendering the terms contestable. 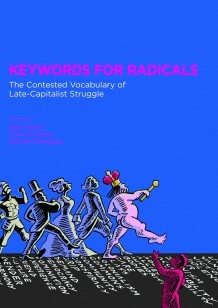 Keywords for Radicals is a considerable enterprise, containing 57 entries with as many authors. Some of the words have been commonplace in the radical milieu and thus are expected to appear herein: representation, utopia, vanguard, oppression, hegemony, rights. Others are timely as relevant additions to radical analyses: commons, crip, prefiguration, and trans*/- (a word that even looks different). One entry that is both timely and traditional: occupy. A.K. Thompson gives us a much-needed analysis of the contested meanings of this word, since key voices even at the time of Occupy Wall Street objected to its usage, citing its colonial legacy. Other keywords were previously radical, became more mainstream, and were recently re-attached to radicality: friend, love, privilege, care, bodies, reproduction, leadership. Some, like populism, have accrued a new prominence since the book’s publication. And of course there are always omissions that are worth mentioning, such as party. I learned much from these entries—they all have some nugget to recommend them, whether as a thorough primer or a curveball thought-changer. For the latter, I would suggest readers start with demand, friend, victory, and accountability. Fritsch, O’Connor, and Thompson lay out three main differences between their book and Williams’ initial project. First, its periodization. It’s not just that vocabulary changes in late capitalism—the editors trace how a number of thinkers, especially those with autonomist tendencies, have analyzed the subsumption of linguistic communication into Post-Fordist economic processes. Along these lines, the editors remind us that Williams (1980) also wrote a piece called “Means of Communication as Means of Production.” If language has been subsumed, then the means are in the hands (some would say brains) of the cognitariat. What would it mean to seize these means of communication? From whom, and by whom? The collection offers an excellent starting point to begin this reappropriation. The second divergence is that while Williams developed a list of wide-ranging terms that could define contemporary flashpoints, KFR teases out words that indicate specific clashes on the radical left. While having broader implications, the material herein is most relevant to political struggles. Fritsch, O’Connor, and Thompson mark Williams’ own attempts at refusing the institutionalization of vocabulary. At the same time, the book embodies this tension over academicization, as many contributors find themselves in different positions vis-á-vis academic institutions (and to this we can add “being reviewed in an academic journal”). Finally, and perhaps most obviously, this work emanates not from a solo author but via collective authorship. The decentralized writing (though centralized peer editing) means that a temporary community is formed in the making of the keywords. Here I should note one of the special features of this collection: the use of infographs in each chapter that visualize the “see also” function. Individual authors created lists of words they thought were related, which were then supplemented by the editors to generate an internal map of the book’s entries. Fritsch, O’Connor, and Thompson are clear that the mere existence of many contested keywords does not result in pluralism or relativism. There is a method here, even a guide to how words are to be understood. In foregrounding the conflict over words as part of wider struggles, the editors refuse to treat the relation of word to thing as a relation of transparency or correspondence. The book instead takes a nuanced, dialectical approach to language. Words are signposts of the linguistic turn, underscoring how language shapes, not just describes, the world. Those readers conversant with the decades-long development of this approach (the introduction covers a number of these thinkers: J. L. Austin, Adrienne Rich, Iris Marion Young, Judith Butler, Stuart Hall) will find this book covering familiar ground, whereas it functions well for those first encountering the linguistic turn. The editors argue that, even if we take as given that language performs rather than reflects, we need to ask how performatives stick. What are the means of authorizing some utterances and meanings as definitions? In addition to the means of communication, we need to examine the means of authorization. Curiously, deconstruction is not mentioned as part of this lineage. As performed by Jacques Derrida and others, deconstruction amounted to an unraveling that exposed the operations of authority through which meaning was established. More than a social constructionist approach to the world via language, deconstruction deployed a series of stratagems and gestures that inhabited an authorizing mechanism to defuse that mechanism’s ability to settle matters. The collection takes its own position in this terrain, one that wards off transparency as a guiding value. If we take as given that power operates not primarily by obscuring its actions but “through extreme contradiction” (p. 5), then clarity and transparency will not address power’s capacities to manage meaning. A word instead is an “index of the struggle to shape reality according to particular interests” (p. 5). Vocabulary here is analogous to the commodity in Karl Marx’s Das Kapital—an analytic starting point that becomes a gateway to the hidden abode of production. A word is examined “so that its contradictions might be productively explored” (p. 18). In paying attention to the words used about keywords, we find transparency banished but revelation installed. Words are indexes of socioeconomic dynamics: “When analyzed closely, words reveal themselves to be symptoms of underlying and overarching social contradictions” (p. 20, emphasis added). This is a method that places importance on the conflicts we “uncover in our most intimate utterances” (p. 18, emphasis added). And again: “Language as object that contains contradictions which, once unearthed, will collapse in favor of the new” (p. 18, emphasis added). Revelation is back, no longer pointing to referents in the world, but to dialectical processes. There is thus a two-step process: (1) “unearthing [language’s] contradictions” and (2) “using those contradictions to map the social world they reflect” (p. 18; emphasis added). Words and world have a common ground: not correspondence, but homology. Each is filled with mirrored contradictions, with words as symptoms whose internal logics can be completed by, then found in, social relations. The collection thus seeks to reground usage not in consensus about meaning (this is not the “OED for Radicals”) but in an epistemological convergence—our maps of the social world will be discoverable as true once we see the linguistic debates in a particular, dialectical fashion. This kind of homology, itself a variant of the base/superstructure model of analysis, is true to Raymond Williams’ legacy and open now to new audiences. Whether these concepts (dialectics, base, superstructure, map, social world, homology, symptom, contradiction, terrain) are worth debating (e.g., by finding their way into their own keywords collection) remains to be seen. Ultimately, we can turn to the collection’s subtitle to summarize its trajectory: This is a contested vocabulary, one whose stakes are found in the book’s context—namely, late capitalism, but moreover the struggles against it. If, in the Trumpist era, we’ve seen an increasing weaponization of tools, techniques, and words, then this collection is a much-needed arms storehouse. This telos raises some curious questions: Do we push the terms to their exhaustion? Could we diminish, banish, reduce, rather than disavow? What would it mean to complete a concept borne out of injustice? 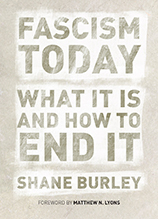 This is a guest post from Shane Burley, author of Fascism Today. Shane has the last event of his east coast tour this evening in Washington, DC—see here for details! White nationalism is implicitly violent, it cannot exist without it. The proposition is, by its own merits, steeped in the most expansive and profound sorts of violence. Even liberal American society, which cannot sustain itself as an egalitarian community without revolutionary change, acknowledges the deep violence that led to its founding and that motivates all meager attempts at social progress. White nationalism sees the violence of the past, from slavery to colonialism to Jim Crow, as compromising measures: that violence is normal to racial relations. This is the “spoils to the victor” mentality crossed with belief in the inferiority of the other that allows the genocide of indigenous people and the ongoing racial revenge against African descended people as a logical and normal response by whites, an ideology that has violence at its center. It’s no surprise when that violence moves from implicit to explicit. In 1979, the Maoist Communist Workers Party (originally named the Workers Viewpoint Organization) staged a rally in Greensboro, North Carolina, where they were organizing with a largely black community of textile workers. Their “Death to the Klan” slogan showed a certain amount of militancy after decades of Klan terrorism. Through the 1950s and 1960s, the Third Era resurrected Ku Klux Klan enacted a paramilitary style war against integration in the South, including lynchings, bombings, and assassinations. By the time the 1970s rolled around they had largely receded as a major terrorist movement after the United Klans of America were taken down by a lawsuit, and were instead channeling into the strange public facing organization that David Duke had intended for it. But in Greensboro, several Klan organizers from the North Carolina Knights of the KKK and the National Socialist Party of America had united to form the United Racist Front. When they went out to meet the CWP on November 3rd, they were joined by informant, Ed Dawson, who was acting as a leader in the movement. 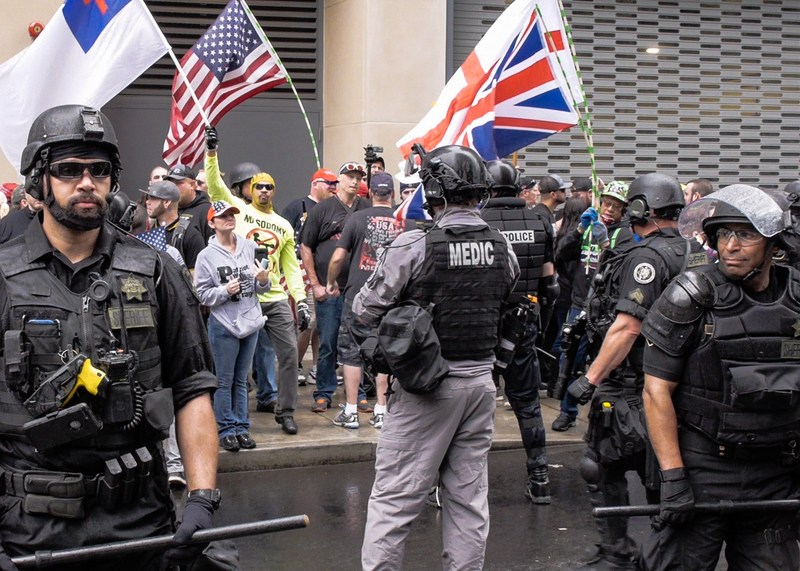 In front of news crews, the white supremacist faction opened fire on protesters, killing five activists rallied with the CWP and one of their own. As documents were later revealed, law enforcement had early knowledge of what was going to take place, a part of their ongoing efforts to infiltrate radical organizations. The Greensboro Massacre has taken a certain place in the history of Klan violence only because, to a large degree, it was the last public show of Klan paramilitary firepower in any coherent fashion and the state’s culpability was apparent even to outsiders. This was not the beginning or the end of white supremacist violence, more of a public blast into our memory, and in the 1980s the Aryan Nations tied organization The Order ran a trail of blood, robberies, and assassinations across the country, leaving us with a reminder of the revolutionary potential of the ideologies. Their ideas increased in virulence as well. Christian Identity took a vulgar reading of the Bible stating that European whites were the “lost tribes of Israel,” Jews were in league with the Devil, and people of color lacked the humanity, and souls, of whites. This led to some of the most militant acts of violence into the 1990s, and skinhead organizations took the street battle to urban areas as they created the ongoing specter of street attacks. When the Alt Right first made itself known in 2015 (it had been lingering around for years before that), people immediately signaled, rightly, that they were ideologically the same as their North Carolina comrades, only with well pressed suits, books of pseudo-philosophy, and an upper-middle-class arrogance. This method was, however, not new by any means. When David Duke took over the largest KKK contingent in the 1970s, he largely dropped the buffoonish robes and argued wedge issues like immigration and affirmative action. He later left the Klan to form the National Association for the Advancement of White People and, throughout the 1980s, built up a base of support and talking points that would lead to his catastrophic political runs in the late 1980s and early 1990s. About the time David Duke was making waves, Jared Taylor, a former PC Magazine editor with a Yale degree, started American Renaissance, a “race realist” publication and series of conferences dedicated to reinvigorating academic-sounding arguments for the racial inferiority of non-whites and the perennial need for “a self-consciously European, Majority-white nation.” He brought together figures like Forbes-editor-turned-anti-immigrant-extremist Peter Brimelow and Kevin MacDonald, whose work has defined 21st Century anti-Semitism by suggesting Judaism was a “group evolutionary strategy” to outcompete non-Jews for resources. This was, again, not new. Figures like Francis Parker Yockey had taken German Idealist and Conservative Revolutionary philosophy and melded it with elements of the left to attempt at a smart, and sober appearing, take on white nationalism. Organizations like the Pioneer Fund, a fascist and eugenic foundation that funded “race science” research used in books like the Bell Curve, had existed since the 1930s, using establishment money to push the academy to validate their most atrocious ideas. The Council of Conservative Citizens, a neo-Confederate group founded in the 1980s as a way of engaging the original membership lists from the pro-Segregationist White Citizens Councils of the 1960s, began holding conferences with scores of public officials, including Mike Huckabee and Trent Lott. At the same time, they were arguing that miscegenation was “against God’s chosen order” and publicly venerated slavery and the antebellum South. All of these organizations had come with a suit and tie, and the Alt Right was merely the latest incarnation of these, built for a Northern audience of meme-lovers and those steeped in paleoconservative, Third Positionist, and European New Right tracts. The argument that the Alt Right will try to make is that their presence is about ideas, not violence, and so the left’s response is hyperbolic at best: it is preparing to respond to violence when all they have are unpopular opinions. The same was said for its organizational ancestors, all clamoring just to have their voices heard in this unjust system of political correctness. 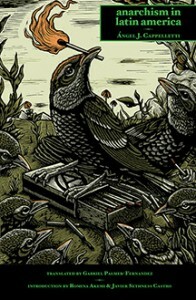 The problem, however, is that their violence is implicit for only so long before it breaks away. The Council of Conservative Citizens, long known for its ties to explicit white nationalist street groups with KKK and neo-Nazi affiliations, was cited as the inspiration for Dylan Roof’s massacre at the Charlton church in 2016. David Duke’s era KKK has been accused of dozens of acts of violence, and its membership went on to form projects like White Aryan Resistance, which was sued into oblivion after its associates murdered an Ethiopian immigrant in Portland, Oregon in the late 1980s. 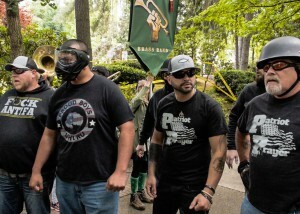 American Renaissance, as a central hub for the white nationalist movement in the U.S., has seen scores of the most violent edges of the racialist movement come through its doors, including members of Aryan Nations who were looking for a home after they lost their compound when several members attacked a black family passing by. It takes little to see the violence that is underneath the surface with their public facing organizations, all it requires is to look at its members, what they do, and what they want. The Alt Right itself has also been mired in violence since its earliest incarnations, though it was hard to pick up on in public discourse because of its diffuse and confused nature. Attacks inspired by the Alt Right, such as the March 2017 killing of a homeless man in New York by James Jackson. He had been reportedly radicalized online by the Alt Right, including interacting with material from Richard Spencer, the founder of the movement. 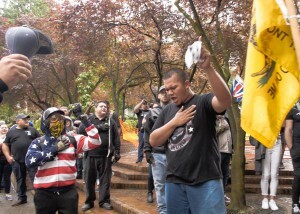 Jeremy Christian took out the anger he honed at Alt Right supporting organization Patriot Prayer, murdering two people in an Islamophobic frenzy on a Portland train. There are more as the news comes in, attacks linked to the Manosphere or those in the Atomwaffen Division, the Nazi Satanist inspired militant racialist organization. What the Alt Right leadership, like Spencer, will tell you is that these are a violent fringe of their organization and that they would never condone that violence. That is likely true yet far beyond the point. Throughout the multiple generations of the KKK, tracing back to its rear-guard action defending the lost Confederacy in the 1860s through the Second Era Klan’s massive growth in the 1920s to its days with the violent United Klans of America, the vigilante violence usually followed a pattern that took itself out of the official functions of those organizations. While the Klan was clearly responsible for its murders, they were rarely “Klan sanctioned” in the most official sense, in the same way that Jim Crow relied on extra-judicial violence to enforce the softer codes issued by the state. The violent rhetoric, the revolutionary aims, and the apocalyptic tone has a way of sanctifying violence, and those “seemingly random” acts of violence are a sheer necessity for those organizations. If they were to admit who and what they are, the public reaction would force the state to cave and target them, and, in times past, they certainly did. After a series of bombings, one that killed four young girls in Birmingham, Alabama, the FBI began to focus in on the Klan violence in the South. As Matthew Lyons has pointed out, this was not out of altruism but of its contest to the state. That happened only after the violence went from its implicit nature, where members were quietly encouraged to engage in violence in their personal capacity to the explicit violence of commands from a pulpit. As the early Morris Dees’ lawsuit that stripped the United Klans of America of their $7 million in resources in 1987, their rhetoric and intention was clear from the start. The violence that these organizations rely on are always stoked with subtlety, rarely carried out as praxis unless they want to completely destroy their above-ground wing and head into the world of pure armed struggle. This makes their violence more persistent, more ever present, always ready to spill over and take lives. This begs the question, then, is Charlottesville, the most public and sensational act of violence from the Alt Right, our generation’s Greensboro Massacre? While there are some parallels, including the steady decline of the Alt Right as the communities they are trying to embed themselves in are able to see their agenda with clarity, it does not seem to match the intentional brutality. There was a decision to attack the CWP with brutal, and public, force, and that came from organizers and not just the fringe. While Charlottesville was the high-water mark in the public face of the Alt Right as (aspirational) mass movement, that says nothing about its potential for violence. What does it take for white nationalist movements to move from public facing community organizing to open acts of terrorism, or Propaganda of the Deed? History shows that it is failure and desperation, the inability to see through their organizing goals in a conventional means and to, instead, turn to acts of spontaneous cruelty. The Order, Timothy McVeigh’s 1995 attack on the Oklahoma Federal Building, and a series of skinhead shootings over the past twenty years have shown this, noting a feeling of helplessness is the best indicator that intentional acts of mass killing are a possibility. After the Greensboro Massacre, many of the white nationalists involved went on to become celebrities in the movement. Harold Covington went on to help form the violent neo-Nazi gang in the UK called Combat 18, which often provided security for the British National Party, as well as creating the Northwest Imperative to call for like-minded people to move to the Pacific Northwest. Frazier Glenn Miller, another co-planner of the attack and long-time white nationalist organizer, gave up on his larger work of building towards an Ethnostate without Jews and decided to complete his mission by shooting a 14-year-old boy and his grandparent who were leaving a Jewish community center in Oakland, Kansas. His years of work for his cause had seen nothing change in his favor and so, like so many before him, he loaded a gun and decided to take some people out on his trip into oblivion. This desperation has become methodology since the 1980s as police crackdown and the left’s counter-organizing has allowed little success for the revolutionary aims of the white nationalist movement. Former KKK and Aryan Nations organizer Louis Beam outlined this most clearly in his paper “Leaderless Resistance,” which favored autonomous violent attacks over formalized organizations since this negated the threat of infiltration and internal dissension. This idea has been taken up by organizations around the world, and that “Lone Wolf” violence has had a persistent effect on giving purpose to the fringes of a movement where they feel ineffectual. All the justification for spontaneous acts of ultra-violence are built in, whether individually or with a few radicals on a mission. This could explain Alex James Fields Jr.’s attack in Charlottesville last year that injured dozens and caused the death of activist Heather Heyer, but this single act occurred during a high moment for the Alt Right movement. What kind of violence happens on their trip to the bottom? The potential for violence in this “suit and tie” movement is there, their desperation assured, and the violence of their ideology is implicit. This could mean that more is on the way, but its leaderless nature means that the violence the Alt Right is fomenting could come from almost any direction. To reclaim the reality of white nationalist violence, both historic and impending, is to reclaim the central function of white identity: violence on the “other.” The character change between the Alt Right and the neo-Nazis is one of minor philosophic shifts and branding, but the underlying cause and the overarching message retain a key component of revolutionary upheaval, of the mythic battle for “survival of their race,” and the growing need for power. Richard Spencer, for his part, has shifted his rhetoric from one of simply the preservation of “identity” to the need to take, and exercise, power in a dominating way. This is not “real politic,” but an acknowledgement that much of the language of identity that has filtered over from the European identitarian movement is disingenuous: what he wants from his Ethnostate is a Great White Empire. And why shouldn’t he say it? Their idealist vision is one that refuses to quit, that will take down opponents as it needs to, and whose sees the only reason to refuse violence is its optics. For the antifascist left, this needs to be a check in to the reality of what is being faced. This is not just an argument, or a political force, but something capable, willing, and inevitably baked in potential violence. The surprising growth of the Alt Right has had one effect that was less predicted, that their violent rhetoric and vulgar racialism would infect the conservative communities they tried to cozy up to. Their violence has extended to the MAGA-Belt, the Independent Trumpists whose anger has become explosive. The fringe of the white nationalist movement is an essential part of it, and it is where the move towards “IRL” violence takes place. They will never “condone” this violence in the practical, instructive sense, but they don’t have to, their message has been heard loud and clear. This creates a perpetual dilemma for the communities they target, both in active points of confrontation and in daily life. 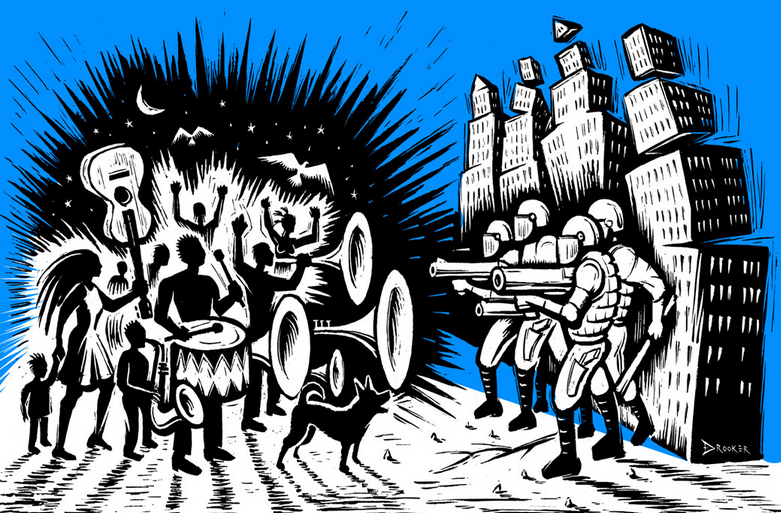 The potential only grows without resistance to stifle it, but conscious community defense and bonds is the only thing that can weather the storm. We have to wrestle with the reality that their violence is genocidal and persistent, and will never evaporate on its own. Matthew N. Lyons, Insurgent Supremacists: The U.S. Far Right’s Challenge to State and Empire (Montreal and Oakland: Kersblebedeb Publishing and PM Press, 2018): 170-171. Eric Ginsburg, “The Greensboro Massacre of 1979, Explained,” Teen Vogue, May 18, 2018. David Neiwart, Alt-America: The Rise of the Radical Right in the Age of Trump (London and New York: Verso Books, 2017): 222. Shane Burley, “How White Nationalists are Setting Immigration Policy in Trump’s White House,” April 27, 2017. Matthew N. Lyons, Insurgent Supremacists: The U.S. Far Right’s Challenge to State and Empire (Montreal and Oakland: Kersblebedeb Publishing and PM Press, 2018): 65. “The Curious Case of the Council of Conservative Citizens,” Anti-Fascist News, June 25, 2015. Elinor Langor, A Hundred Little Hitlers: The Death of a Black Man, the Trial of a White Racist, and the Rise of the Neo-Nazi Movement in America (New York: Metropolitan Books, 2003): 344-350. Shane Burley, “As the alt-right moves to violence, community responses matter,” Waging Nonviolence, June 1, 2017. Mike Wendling, Alt Right: From 4Chan to the White House (London: Pluto Press, 2018): 190-191. Shane Burley, “Institutionalizing Long-Wolf Terrorism: How Fascist Organizations Inspire Mass Violence,” The Hampton Institute, September 21, 2015. Matthew N. Lyons, Insurgent Supremacists: The U.S. Far Right’s Challenge to State and Empire (Montreal and Oakland: Kersblebedeb Publishing and PM Press, 2018): 168. Elinor Langor, A Hundred Little Hitlers: The Death of a Black Man, the Trial of a White Racist, and the Rise of the Neo-Nazi Movement in America (New York: Metropolitan Books, 2003): 271-277. Alexander Reid Ross, Against the Fascist Creep (Chico: AK Press, 2017): 284. “Frazier Glenn Miller,” Southern Poverty Law Center. Martin Durham, White Rage: The extreme right in American politics (London and New York: Tourtledge, 2007): 103-104. The following is an excerpt from the first English-language edition of Peter Kropotkin’s Modern Science and Anarchy—which we’ve just published! 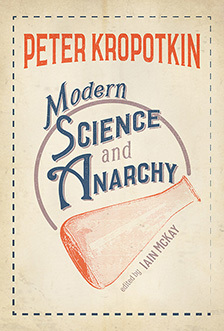 A portion of the book is devoted to Kropotkin’s study of the nature and origins of the State. This brief excerpt comes at the end of a lengthy critique of the State-form. You can order the book itself here. Mark your calendar now, and stay tuned for more details and events to come! We’re eagerly awaiting the release of our new graphic novel Prisoner 155: Simón Radowitzky by Agustín Comotto, and in the meantime we thought we’d get you excited about it too! So we’ve put up a few sample pages for you to flip through to get a sense of the beautiful artwork and Comotto’s storytelling. You can preorder the book now for 25% off list price, and get your hands on a copy as soon as it’s released! We’ve just published the incredibly important (if we do say so ourselves) English translation of Anarchism in Latin America, Ángel Cappelletti’s sweeping overview of the movement’s origins and development across the region, from the Caribbean to Mexico and Central and South America. It’s hard to choose an excerpt, given the varied histories Cappelletti shares, but this snippet of a few pages from his Preface should give you a good sense of the book—and of Gabriel Palmer-Fernández’s wonderful translation. As with other ideas of European origin, anarchist ideology was a product imported to Latin America. But ideas are not simply products. They are also living organisms and, as such, ought to adapt themselves to new environments; in so doing, they evolve in lesser or greater ways. To say that European immigrants brought anarchism to these shores states only the obvious. And to take that as a kind of weakness is plain stupidity. 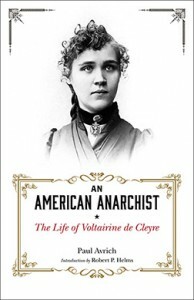 Like the very ideas of nation and of a nationalistic ideology, anarchism comes to us from Europe. Anarchism is not merely the ideology of the working and peasant masses who, arriving in the new continent, are robbed of their hopes for a better life and witness the exchange of oppression by the ancient monarchies for the no less brutal oppression of the new republican oligarchies. Soon some of the native and also indigenous masses adopt the anarchist view of the world and society, from Mexico to Argentina, and from Francisco Zalacosta in the Chalco to Facón Grande in Patagonia. It is seldom noted that the anarchist doctrine of self-managed collectivism has a close resemblance to the ancient ways of life and organizations of the indigenous peoples of Mexico and Peru, ways of life that were practiced prior to the imperialism of not only the Spanish, but also the Aztecs and Inca before them. To the extent that anarchists reached the indigenous, they did not have to inculcate exotic ideologies but only to make conscious the ancient peasant ideologies of the Matagalpan calpulli and the Andean ayllu. At the same time, a tendency towards liberty and indifference towards all forms of statist structure was already present in the Creole population. When that tendency was not usurped by the ways of the feudal caudillos, it proved fertile soil for a libertarian ideology. Few mention the existence of an anarchist gauchaje in Argentina and Uruguay, or its literary expression in libertarian payadores. But those matters aside—undoubtedly they will be looked upon as having little consequence by academic and Marxist historians—without hesitation we can say that anarchism took root much more deeply and extensively among indigenous workers than did Marxism, perhaps with the exception of Chile. It is important to note that from a theoretical perspective, even if the Latin American movement did not make fundamental contributions to anarchist thought, it did produce forms of organization and praxis that were unknown in Europe. For example, the Federación Obrera Regional Argentina (FORA), a labor union that was majoritarian (becoming almost the only union), never conceded to syndical bureaucracy, and developed an organizational form as different from the Confederación National del Trabajo (CNT) and other European anarcho-syndicalist unions as it was from the North American Industrial Workers of the World (IWW). A second example, typically Latin American, is the Partido Liberal Mexicano (PLM). Primarily through the efforts of Ricardo Flores Magón, within a few years of its founding it adopted an ideology that was unquestionably anarchist, nonetheless keeping its name while continuing as a political party, and thereby earning sharp criticism from some European orthodox thinkers like Jean Grave. With the exception of that singular case, anarchism in Latin America is nearly always anarcho-syndicalism and is essentially linked to workers’ and peasants’ organizations. To be sure, there were some anarcho-individualists in Argentina, Uruguay, Panama, and other places, as well as anarcho-communists, the latter foes of the syndical organization in Buenos Aires in the 1880s and 1890s. But the vast majority of Latin American anarchists were adherents of a revolutionary and anti-political syndicalism—not, as some say, a-political. That is an important difference between Latin and North American anarchism. An anarchist syndicalism was evident in the United States and its greatest witness was the sacrifice of the Chicago martyrs. It represented the continuation of the anti-slavery movement into the industrial context, and was promoted by Italians, Germans, and Slavic immigrants, with the German Johann Most as its revolutionary prototype. Later a revolutionary syndicalism emerged (anarchist or quasi-anarchist) among the working classes, organized through the IWW. There was also an earlier movement unrelated to the working classes, represented by important literary figures such as Thoreau and Emerson. Its predecessor is found in the liberal radicalism of Jefferson and other eighteenth century thinkers, and is perhaps represented today by what is known as “libertarianism.” While it was not an anti-workers’ ideology—although today there are Right-libertarians—it developed along lines quite alien to the struggles of the working classes, and its principal concerns include individual human rights, anti-militarism, and the abolition of bureaucracy and the State. But anarchism developed in different ways in the various Latin American countries. In Argentina, FORA was sufficiently radical to be considered extremist by the Spanish CNT. In Uruguay it tended to be nonviolent, as Max Nettlau notes, perhaps because it was less persecuted, except during the last dictatorship. In Mexico it influenced government not only because of Magonist participation in the revolution against Porfirio Díaz, but also because La Casa del Obrero Mundial provided Venustiano Carranza his “red battalions” in the fight against Villa and Zapata, and because the leadership of the Confederación General del Trabajo (CGT) engaged President Obregón in public political debates. In Brazil, on the other hand, it was always at the margins of the state, and the military-oligarchic republic did nothing but persecute, ostracize, or assassinate its leaders. A phenomenon common in several Latin American countries between 1918 and 1923 was anarcho-Bolshevism. Following the Bolshevik revolution many anarchists in Argentina, Uruguay, Brazil, and especially Mexico supported Lenin and declared their unconditional support of the Soviet government, yet still considered themselves anarchists. With Lenin’s death this trend disappeared. Those who still chose to follow Stalin no longer dared to call themselves anarchists. In addition to a vast newspaper propaganda and extensive bibliography, anarchism in all Latin American countries produced many poets and writers who were among the most prominent in their respective national literatures. They were not, however, equally numerous and important in all regions. It is safe to say that in Argentina and Uruguay most writers publishing between 1890 and 1920 were at one time or another anarchists. Likewise in Brazil and Chile, where during this time there were more than a few literary anarchist writers, though not as many as in the Río de la Plata region. In Columbia, Venezuela, and Puerto Rico, if a properly anarchist literature did not fully flourish, the influence of a libertarian ideology was greater among writers and poets than in the workers’ movement. But even in those places where literature and anarchism were nearly synonymous, as in the Río de la Plata, anarchist intellectuals never played the role of elite or revolutionary vanguard, nor did they have any dealings with universities or official culture. In this respect anarchism’s trajectory differs profoundly from that of Marxism. The decline of the anarchist movement in Latin America (which does not imply its total disappearance) may be attributed to three causes. First is a series of coups d’état, mostly fascist, in the 1930s—Uriburu in Argentina, Vargas in Brazil, Terra in Uruguay. All are characterized by a general repression of the workers’ movement, Left-leaning groups, and particularly of anarchists. In certain cases (e.g., Argentina) the state achieved the total dismantlement of the organizational and propagandistic structure of the workers’ anarcho-syndicalist federations. A second factor is the founding of communist parties (Bolsheviks). The support of the Soviet Union and of affiliated European parties gave them a strength sorely lacking in anarchist organizations, which had no other resources than the dues paid by their own militants. Some anarchists chose to join the communist party, more in some countries (Brazil) and fewer in others (Argentina). Finally, the emergence of nationalist-populist sentiments more or less linked to the armed forces and, in a few cases, with the promoters of fascist coups completes the factors that caused anarchism’s decline. The unique situation of dependence in which Latin American countries found themselves with regard to European and, above all, North American imperialism caused the class struggle to be substituted by struggles for national liberation. Consequently, workers conceived of their exploitation as arising from foreign powers. The bourgeoisie, both domestic and foreign, together with various sectors of the military and the Catholic church, convinced them that the enemy was not Capital and State as such, but foreign Capital and State. Skillfully manipulated, this very conviction was the principal cause of the decline of anarchism. All else is secondary, even the intrinsic difficulties faced by anarchist organizations in the actual world, such as the need to make unions function without bureaucracy or the impossibility, real or apparent, of concrete proposals. 1 In the language of the Matagalpan Indians calpulli refers to a group constituting the fundamental unit of Aztec society. Ayllus were the basic political and social units of pre-Inca life (Trans). 2 In Argentina, Uruguay, southern regions of Brazil, as well as in parts of Paraguay and Chile, a musical form accompanied by guitar (Trans).